YIWU, Xinjiang: Thousands of astronomers and tourists witnessed a total solar eclipse on Friday evening in Yiwu county of the Xinjiang Uygur autonomous region. The celestial event lasted two minutes, the China National Astronomical Observatory, said. In Yiwu, one of the best places to observe the eclipse, the event happened at 7:08 pm when the moon covered the sun, Zhao Gang, vice-head of the National Astronomical Observatory under the Chinese Academy of Sciences, said. Thousands of sky-gazers from more than 10 countries gathered at an observation square that opened on Friday in Yiwu. Zhang Bo, a middle school student who came from Shenzhen in Guangdong province with his teacher and classmates, was excited about the atmosphere. "My dream is to become an astronomer to explore the secrets of the universe," he said. A solar eclipse occurs when the moon passes between the Earth and the sun, totally or partially blocking the Earth's view of the sun. 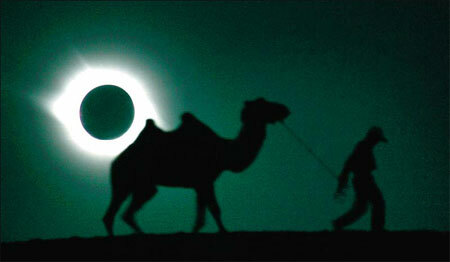 The next total eclipse in China will occur in January. Friday's eclipse on Aug 1, the first in China in the new century, was visible from 6:59 pm Beijing time. As well as Xinjiang and Gansu, people in several other regions, including Shaanxi and Hong Kong, saw a total or partial eclipse.